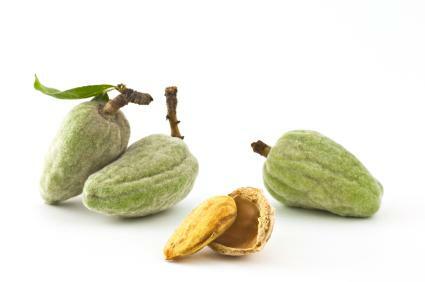 Almonds help create that unique Amaretto flavor. Every collection of popular mixed drinks should have a little something to please everyone, including an amaretto sour recipe. While the basic formula has only three ingredients, there are many variations to dress the drink up and change its personality. Amaretto is an almond-flavored liqueur made from the pits of almonds or peaches or a combination to the two. It has added sweeteners to cut the bitterness of the pits, as well as natural or artificial almond extract included for extra flavor. The liqueur's name is a derivative of the Italian word "amaro," which means bitter, and the suffix "etto" indicates a diminished or light touch of bitterness. The words amare and amore, which mean love, are frequently associated with the sweetness of the liqueur. The combination of the two could be construed to reflect the bittersweet aspects of love itself. This delightful combination is among the easiest drinks to make. Combine and shake the liqueur and mix in a cocktail shaker. Pour the contents into a glass and add crushed ice and as many cherries as desired. For an elegant touch, dip the rim of the glass in lemon juice and coat it with granulated sugar before adding the liquid and cherries to the glass. As with many cocktails, drinkers and bartenders have added ingredients to the original amaretto sour recipe to create different tastes that appeal to assorted palates. All variations follow the same mixing and serving procedures as the original recipe for amaretto sour cocktails. To turn an amaretto sour into a stone sour, just add a splash of orange juice to the mixture before serving. Mix 2 ounces amaretto with 1 ounce each of sweet and sour mix and white wine. Either sweet or dry white wine is acceptable. This mixture will make you pucker. Mix 1 1/2 ounces amaretto with 1 ounce each of limeade and lemonade. Stir together 1 ounce vodka and 1 ounce amaretto. Fill the glass with sweet and sour mix. If the guest of honor at a dinner or cocktail party is a big fan of amaretto sours, serving this fancy version of the drink is sure to impress both the honoree and the gathered friends and family. It includes Prosecco, a dry, white sparkling wine mainly produced in the Veneto region of Italy. This recipe is for one drink, so adjust the quantities to accommodate the number of guests. Stir the water and 1/2 cup sugar together in a small saucepan. Over medium heat, bring the mixture to a boil and constantly stir until the sugar completely dissolves and creates a simple syrup. Set the syrup aside to cool. In a rimmed saucer or shallow bowl, combine the remaining sugar and zests. Rub the rim of a double old-fashioned glass (also called a lowball or rocks glass) with the cut side of the lemon half, being sure to moisten it on both the inside and outside of the glass. Invert the glass into the sugar and slowly turn to evenly coat. Gently mix the Prosecco, amaretto, lemon juice and 2 tablespoons of the prepared simple syrup in a cocktail mixer or pitcher, taking care not to destroy the bubbles in the wine. Place a few ice cubes in the bottom of the glass and pour in the drink mixture without disturbing the sugar-coated rim. Garnish the drink with the citrus fruit slices. With so many ways to prepare an amaretto sour, you'll definitely have fun trying out each of these recipes to decipe which one is your ultimate favorite. Just don't try them all at once!